The all-in-ONE Endoscope Cleaner delivers the four enzymes needed to breakdown and remove all forms of proteinaceous bioburden. Four enzyme endoscope cleaners are necessary to break down all forms of bioburden. Endoscope cleaners that do not deliver lipase endoscope cleaning enzymes, amylase endoscope cleaning enzymes, carbohydrase enzymes, and protease enzymes cannot remove all forms of surgical instrument proteinaceous bioburden. The single or dual enzyme endoscope cleaners cannot remove all forms of surgical instrument proteinaceous bioburden and they do not deliver the detergent surfactant agents that are critical for cleaning the surface of endoscopes. Enzymatic Endoscope Cleaning Sponges to the power of 4 that deliver Endoscope Cleaning Enzyme Detergents that are non-irritating to the eyes, nose, and throat, and 100% biodegradable. The tubular endoscope and surgical instrument cleaning sponges are uniquely contoured to fit around the outside sheath of scopes and are pre-saturated with the all-in-ONE enzyme detergent lubricating cleaners to provide a quicker, more thorough pre-cleaning. The ONEcleaner is a neutral pH, multi-tiered enzymatic detergent, specifically formulated to remove gross contaminants while targeting insoluble polysaccharides that encase Biofilm, exposing them to high level disinfectants or liquid chemical sterilizing agents. This helps aid in the removal of all bioburden and biofilm from scope and surgical instrument surfaces. The all-in-ONE enzyme detergent lubricating cleaners sponges, now with enzyme detergent lubricating cleaning technology, and are highly recommended for all scopes where biofilm build-up can develop as a result of constant exposure to wet and dry phases during usage and reprocessing. These super absorbent sponges are designed to hold the all-in-ONE enzyme detergent lubricating cleaners, so that it guarantees to disperse the detergent over the scope and instrument surface and distribute it more evenly. This will provide longer contact time with bioburden and contaminants so that the four enzyme detergents can break down all forms of proteinaceous bioburden, emulsified lipids and mineral incrustations. Replace enzyme cleaners, cleaning chemicals, stain removers, surface conditioners, and surgical instrument lubricants. Enzymatic enzyme detergent surgical instrument and endoscope cleaners are surfactant based cleaners and conditioners for breaking down proteinaceous soil, removing stains and cleaning endoscopes. Replace cleaning and conditioning products for: hydrating dried on debris from Endoscopes, pre-cleaning and soaking Endoscopes, removing stains from Endoscopes, enhancing the passive layer to prevent corrosion, manually cleaning surgical instruments, ultrasonic cleaning surgical instruments, and automated cleaning surgical instruments. The Surgical Instrument Detergent enzyme detergent and easy FOAM-it Pre wash Instrument Detergent Cleaner, deliver the most effective surgical instrument enzyme detergent cleaner available. The Endoscope Instrument Cleaning Sponges remove and retain more debris and deliver more pre-loaded enzyme detergent cleaning solution than other instrument sponges and paper based wipes. The Sponge Pouch delivers more (215 ml) cleaning power. The pre-loaded Enzyme Detergent is four times more effective than other enzyme sponge cleaning solutions, delivering the four enzymes needed to breakdown all forms of proteinaceous bioburden, plus the surface cleaning detergents needed for rapid and effective sponge cleaning. The endoscope enzyme detergent cleaner is highly concentrated for more effective surgical instrument, endoscope, and bedside patient care equipment cleaning outcomes. 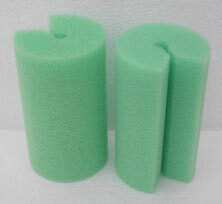 The tubular and flat endoscope cleaning sponges are avail;able preloaded with endoscope enzyme detergent cleaners that offer an additional margin of Safety when cleaning contaminated surgical instruments. The sponges deliver highly concentrated endoscope four enzyme detergent cleaning power that is non-irritating, neutral ph, non hazardous and biodegradable. Contact us for surgical instrument cleaning detergents, surgical instrument cleaners, and surgical instrument cleaning detergents that lubricate while they clean.